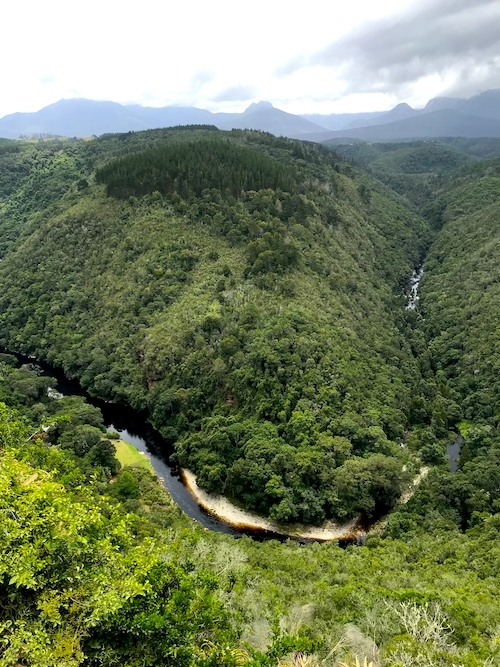 The most beautiful and popular National Park of the Garden Route is the Tsitsikamma National Park. Its breathtaking scenery and coastal sections are peppered with some great hiking trails. 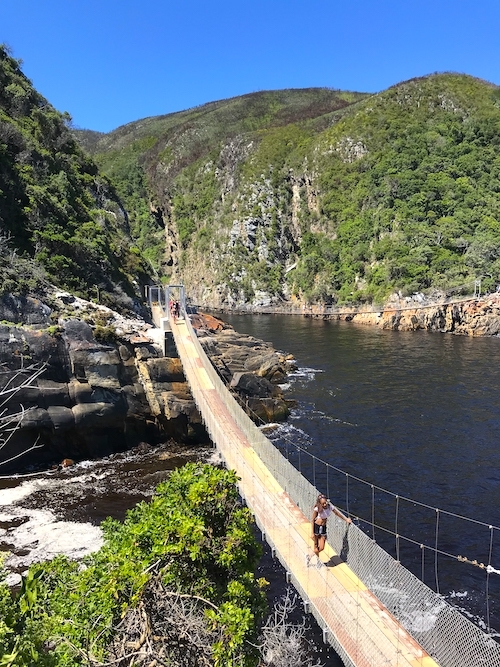 The most famous trail is called the Mouth Trail, which takes you to the great Storms River Mouth Suspension Bridge in about 45 minutes. From there you can follow a steep path that leads you to an observation deck in about 30 minutes. From there you can enjoy a great view of the suspension bridge and the surrounding coastline. 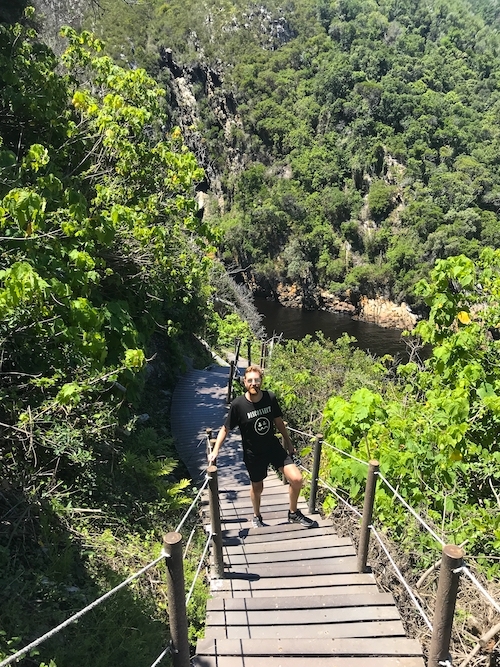 Furthermore, you can do canopy and kayak tours in the national park or you can jump from the 216 meter high Bloukrans Bridge (the highest bungee jump in the world). The city of Plettenberg Bay is one of the most popular seaside resorts along the Garden Route. The city has some great beaches to offer and also the charming center is worth a visit. There are also some great hotels in Plettenberg Bay, where you can relax for a few days. One of them is the Sky Villa Boutique Hotel which offers a great view of the city. Plettenberg Bay is also the starting point for various day trips in the area. 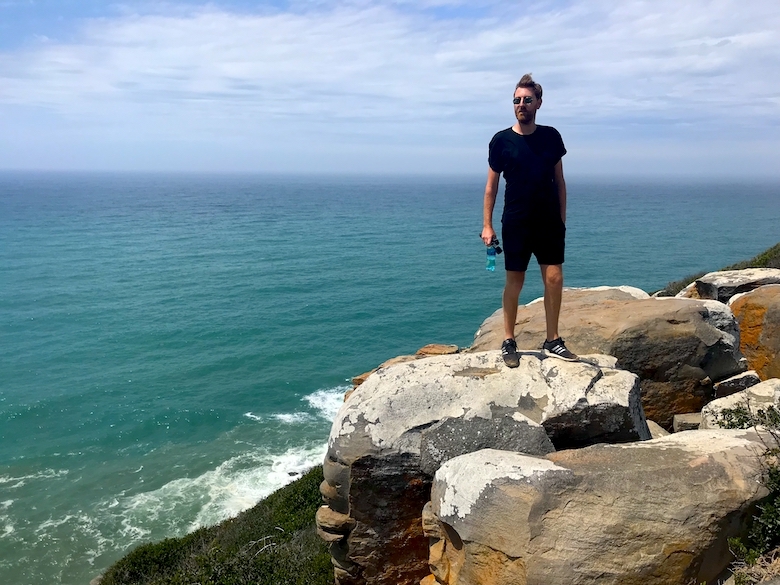 My highlight in Plettenberg Bay was the Robberg Nature Reserve, a peninsula about 3.5 km long, famous for its beautiful hiking trails. Rugged rock formations, seabird colonies and sprawling beaches are just a few highlights of the Robberg Nature Reserve. 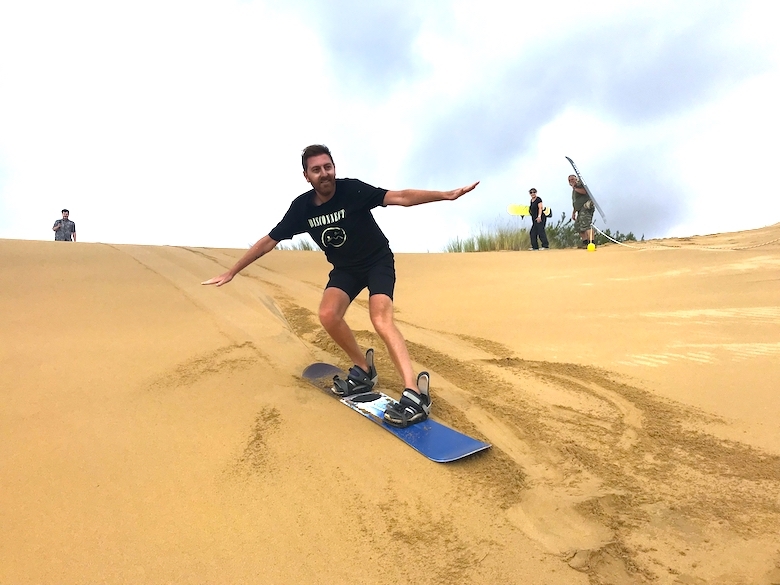 I did already some sandboarding in Peru and liked it so much, that I could not resist participating in a sandboarding tour in South Africa as well. I did the tour with Dragon Dune Sandboarding. The company offers three-hour sandboarding tours daily (only weather permitting). Since we were a small group of only four people, we had enough time to slide down with our sandboards several times. The highlight, however, was clearly the 170 meter high Dragon Dune, which we were sliding down on a plexiglass board. Wilderness is a coastal town with about 6,000 inhabitants. The city has a few beautiful viewpoints to offer such as the Kaaimans River or the “Map of Africa”. There is also a great national park in Wilderness. 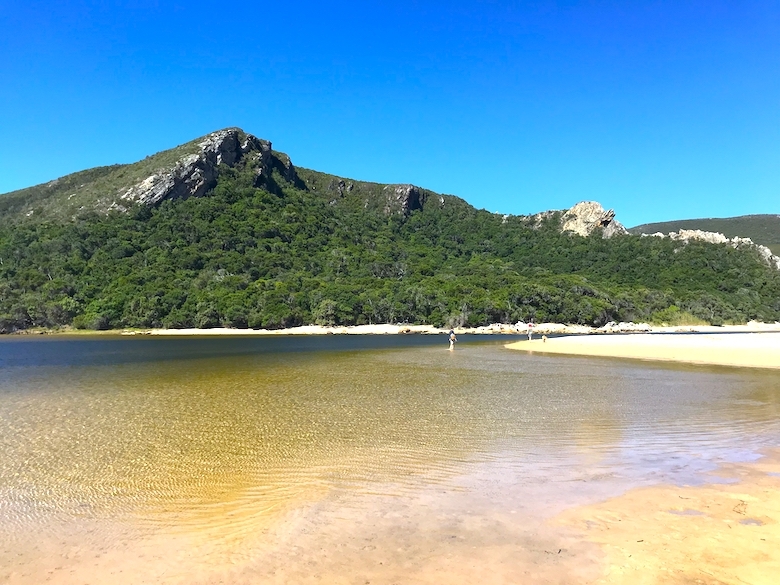 The Wilderness National Park is not very big, but offers great outdoor activities. I rented a kayak for three hours and paddled along the Touws River till I reached a hiking trail. I followed the trail for about 30 minutes to a large waterfall. This tour was just great! Alternatively, you can follow the “Giant Kingfisher Trail”, which also leads you to the waterfall. 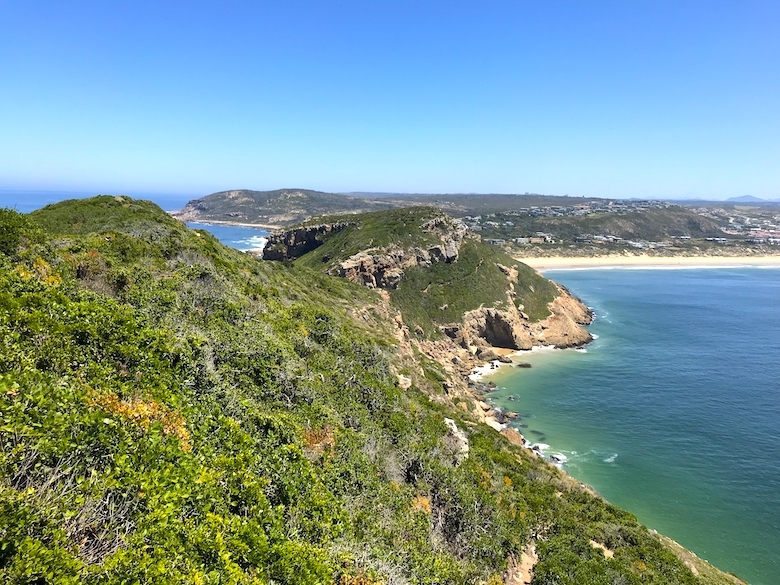 The most popular hiking trail in Mossel Bay is the Saint Blaize Hiking Trail. It is about 14 kilometers long and starts at the St. Blaize cave. The trail is easy to walk and takes you along the Indian Ocean from Mossel Bay to Dana Bay. Halfway you can see the impressive Pinnacle Point caves used by humans during the Stone Age. From Dana Bay you can go back to Mossel Bay with a shuttle or an Uber. For the hike you should plan about six hours and take enough water with you. If you’re looking for some rest and relaxation, you’ll want to stay in the small village of Nature’s Valley. 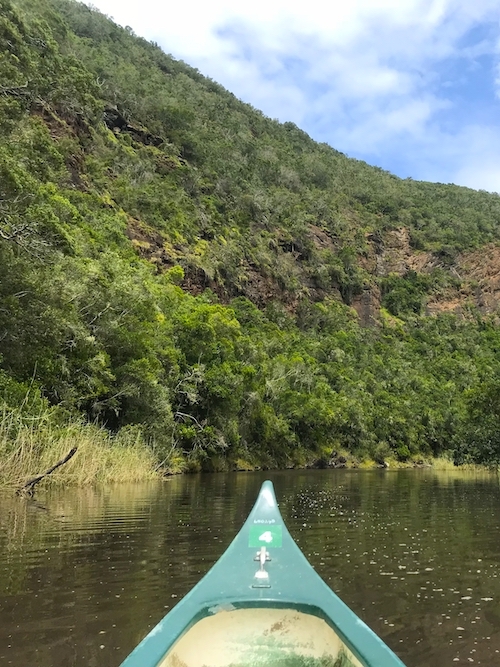 Nature’s Valley boasts 20 miles of pristine sandy beach, the magical Groot River Lagoon and cozy B&Bs. A place for those who prefer to slow down. 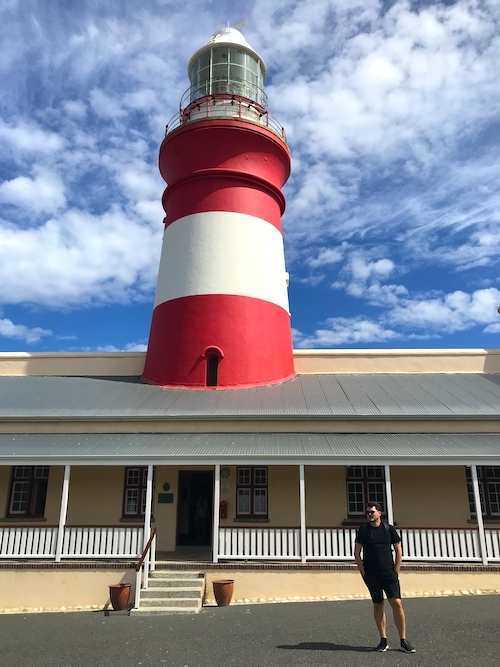 Cape Agulhas is in close proximity to the Garden Route and can be visited on the way from Cape Town’ to the Garden Route or on a day trip from Mossel Bay. 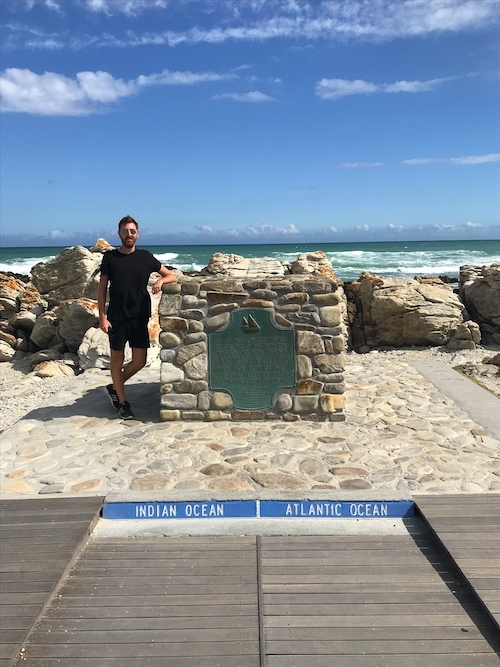 Cape Agulhas is best known for ending the African continent. It is thus the southernmost point of Africa. This is where the Indian Ocean and the Atlantic meet. There are a few beautiful hiking trails and also one of the oldest lighthouses in the country. On the way from Cape Town to Mossel Bay you will find a wonderful natural paradise. 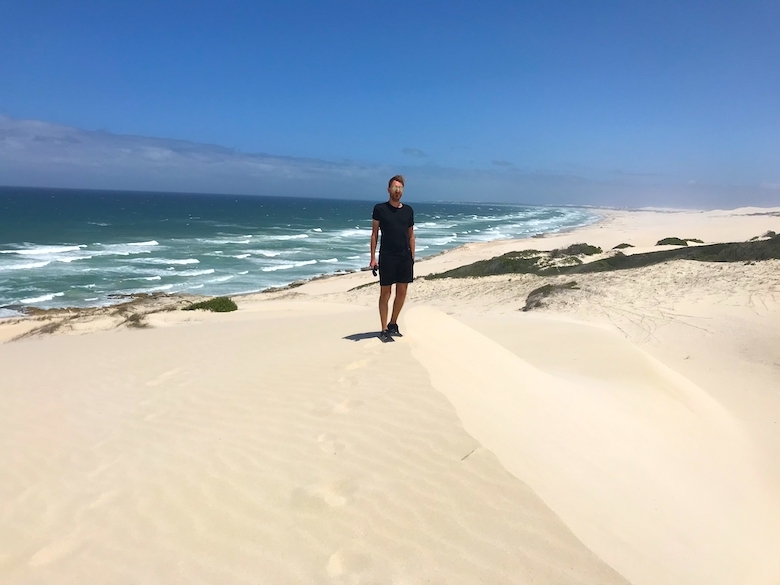 The De Hoop Nature Reserve awaits you with breathtaking sand dunes and numerous wild animals. I have seen turtles, monkeys, ostriches and eland antelopes. The journey takes place via a somewhat unpleasant 50-kilometer track, but you will be rewarded with a great flora and fauna. Just north of the Garden Route, in the small Karoo, is the town of Oudtshoorn. 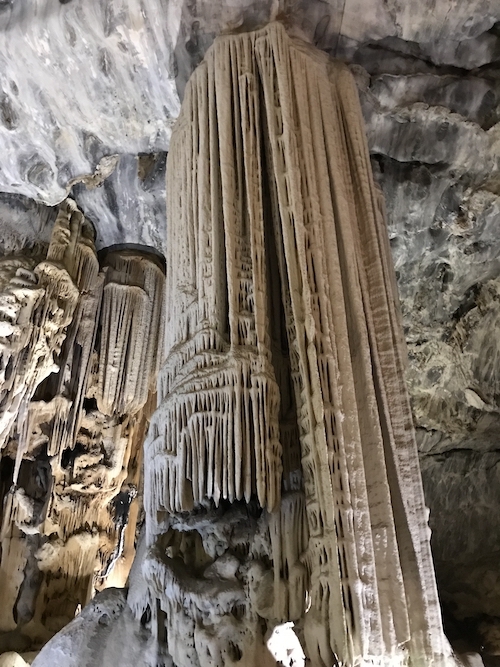 The city itself has very little to offer, but the reason why tourists come to Oudtshoorn are its numerous ostrich farms and the impressive Cango Caves. 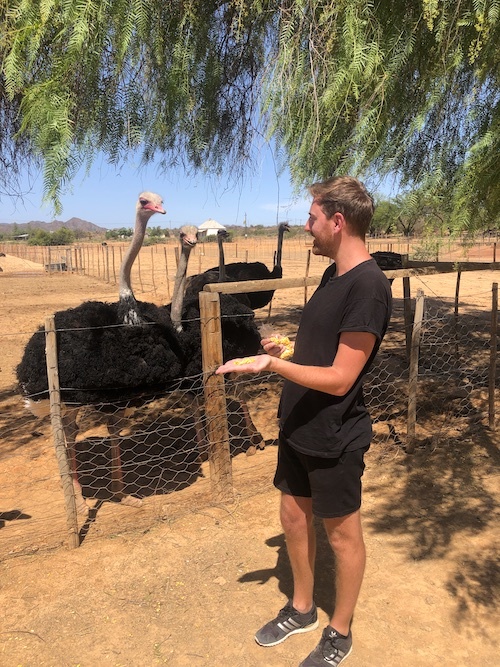 I visited the Highgate Ostrich Show Farm and loved the one-hour tour. I was told a lot about the breeding and the use of ostriches. In addition, I was allowed to hold a small ostrich baby in my hands and feed adult animals. In the evening I ate ostrich meat, which tasted sensational, in the wonderful restaurant The Colony. Also a visit of the Cango Caves couldn’t be missed, since they belong to the most beautiful cave systems of the world. The tour lasted an hour and was well worth it, despite the high number of participants. 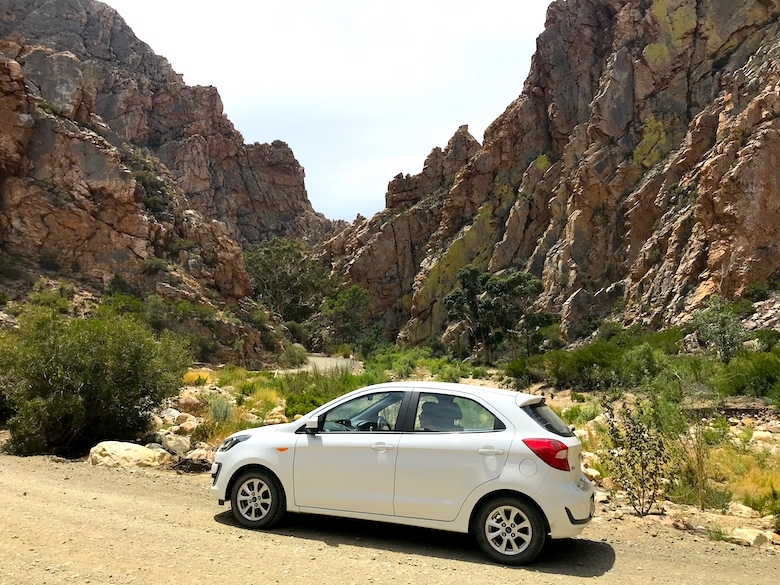 Close to Oudtshoorn is the breathtaking Swartberg Pass. To cross the pass you have to follow a rather unpleasant gravel road, but the great views and photo opportunities make up for it. Especially the last kilometers before Prince Albert are amazing.